I realized the other day that in 20 years buying cars I've never been back to the same dealership twice. Why? Because they always end up using time-wasting tactics (making you wait hours, sometimes), they're dishonest, they try and cheat you, put you in something you don't want, etc, etc, etc. Well, I experienced none of that pain dealing with Vic Kirilenko and Park Place. I bought two cars through Vic last year (an Audi S5 and a Porsche Cayenne Turbo). Both times, the process was pressure-free, painless, and (shock horror!) actually enjoyable. So enjoyable I find myself researching other cars just so I have an excuse to work with Vic again. The guy is a gem - honest, helpful, genuinely pleasant and a joy to work with. Yesterday, I went back to get the ball rolling with Vic on a new car. This, after spending a couple of hours at a "regular" dealership looking at a similar model. The difference at Park Place was remarkable. At the regular dealership, I was on-edge, tense and stressed. As soon as I walked through the door to talk to Vic, I was relaxed, comfortable, and confident that should we find the car I want I will be treated fairly and get a good deal. I'm never going anywhere else again, ever. Why would I? Vic will find me anything I want, at a fair price, and to top it all off provides the best after-sales support I've ever had (anywhere, now I think about it, not just including car dealerships). Good job, Park Place and Vic. Keep it up. You guys are amazing. Park Place is an incredible dealership. I have longed admired their large selection of impeccable high-end automobiles, so when it came time to sell my car, I contacted them first for a consignment sale. I had the pleasure of dealing with Bryan Pratt in their consignment department, who is extremely knowledgeable, honest, and professional. Bryan made the consignment process extremely hassle free. Park Place sold my car in only two weeks at our mutually agreed price. Bryan communicated with me regularly throughout the entire process. Because I travel quite a bit, a consignment sale was my best option, and Park Place did an incredible job prepping the car, advertising, communicating, and closing the sale. I received my payment on time and as promised. If you are considering consigning your luxury or exotic vehicle, I highly recommend trusting your business with Park Place. Contact Bryan Pratt. He will take very good care of you and your vehicle. I would highly recommend the service at Park Place LTD, I bought a Mercedes SL500 which right valve cover leaks and brake fluid was dirty, but I got it fixed , they flushed brake fluid and changed oil + filter, the service was great. The service staff is friendly, I don't know a lot about my SL500 but, Doug Taylor took the time to explain and give me information on what I need know. Doug is a knowledgeable man who knows exactly what he's doing, he is also attentive and polite. This a well deserved compliment of Victor Kirilinko's professionalism in his efforts to provide me the information requested in considering purchasing one of Park Place Ltd's used MB SLK's. Vic was always courteous, timely in his responses and always provided the information or pictures I requested. Any potential customer of PP would be very fortunate to have Vic as their Salesman. Just bought my 3rd car from Park Place and I'd have a hard time going anywhere else. If for some perverse reason you like to go to traditional car dealerships and get pressured by a typical car sales person, then don't go to Park Place. But if you want to have a buying experience that's smooth, easy and at your pace, then this is the place to go. Outstanding values on some very nice cars too. David Bruski was great and I'd highly recommend him. He and really everyone there are true "car people". We started dealing with Park Place (David Bruski) about a year and a half ago. I was looking for a birthday present at the time I could not get any Mini Cooper Countryman my surprise Park Place had one which fit my price point. David Bruski went out of his way to get all the extras I wanted on the Countryman. My experience since then has been outstanding. Having a great Sales person like David made the experience of buying a car a breeze. Not only did he know everything about all the cars we purchased but we also enjoyed the history behind the cars purchased. David is a great asset to Park Place if it wasn't for David I doubt very much that we would still have the relationship we currently have Park Place. I've been in the market for a BMW for a few months now and I happen to stumble upon the exact car at Park Place. I decided to contact the dealership via email and promptly received a return call from Hunter Ross. My initial conversation with Hunter left a great first impression. I was expecting a typical high pressure "do whatever it takes to get this person in" used car salesman, but what I got was a professional sales consultant. When I got to the dealership and met Hunter, he had the car ready to view and test drive. There was no pressure or tacky sales tactics to try and get me to buy now; I actually felt like I was talking to a friend. After the test drive, we went in to talk numbers and it was such a pleasant experience. We were able to make a deal within 10 minutes! The signing of the paperwork was also a breeze and took less than 15 minutes and there was no cheesy "up sale". I would definitely recommend visiting or calling Hunter Ross of Park Place LTD to anyone in the market for a new vehicle. I first met Hunter 3 years ago when I took my Viper up to Parkplace so they can sell it for me. I was so impressed with Hunter and the entire team, i kept going back just to say hi and look at their inventory time to time. I just recenlty purchased a car from Hunter and I knwo why i keep going back.. they treat you well and you are welcomed anytime. Great dealership and great people. I can't wait to see what would my next car will be. I have purchased and sold several specialty vehicles through David Bruski at Park Place over the last 2 decades. 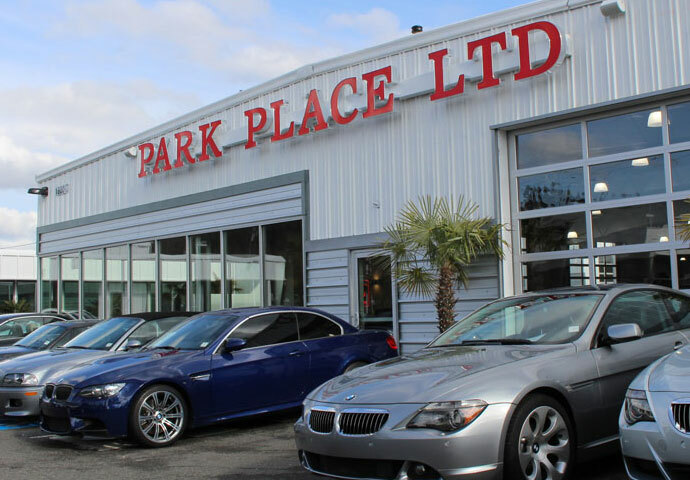 I have found the wide selection of vehicles at Park Place to be quite exceptional compared to other specialty vehicle dealers in the Pacific Northwest. In regards to David Bruski, David is one of the most knowledgeable specialty vehicle sales associates in the business. David makes it his business to know the details about the many makes and models that are inventoried at Park Place. David conducts business with courtesy and respect, and maintains high standards for personal and professional integrity. If you are looking for a specialty vehicle, I would highly recommend David Bruski and Park Place. I just bought a Porsche from Park Place. I did all the pre-purchase negotiations by email with David Bruski and feel it all went very well. Response from David was very fast each time and we must have exchanged a couple of dozen emails. Being hard of hearing email was very important to me. I felt comfortable throughout the test drive and final negotiation at the dealership. I would recommend David and Park Place to friends looking for the class of car that Park Place sells. I am taking time to write this review to extend my appreciation to Park Place and Hunter Ross who helped my wife and I truly enjoy the car purchasing event . I do not write reviews and believe if someone is doing their job , that is what they get paid for . So, believe me when I say Park Place and Hunter went ABOVE and BEYOND in making this experience a great memory . It began when my wife picked the Audi S4 as her vehicle of choice .We live less than 2 miles from the West Coast Audi Dealership in Fife . After searching Nationwide for S4 s we decided to Purchase our S4 from Park Place . Hunter worked hard to answer all our questions and even had the Audi taken to the Bellvue Audi dealership to be inspected the oil changed so I could have a starting block work data point. To my surprise, Park Place has all accurate records that matched Audi's record system (a rarity in dealerships) . This purchase was a "Surprise" for my wife's birthday and so before the big reveal -again without asking -Park Place got word and decided to have it detailed at their wonderful Auto Salon and wrap it in a huge red bow ! Along with some PARK Place birthday GOODIES OF THEIR OWN ; Hunter and park Place DELIVERED on their promise . This the second vehicle I have purchased from them and even out of state or country , Iam pretty sure will be the only place I will buy from , if they don't have the car they will try and find it. Owner of a BMW M5 on consignment for a total of nine months at two other Puget Sound area indoor showrooms with no sale then found Park Place Ltd. Once in their possession the car sold in a matter of weeks and in my opinion it was due to the high end showroom, quality inventory, less than pushy sales personnel and a location that receives lots of traffic and attention. Would refer Park Place Ltd. to anyone with no questions asked and look forward to doing business with them again in the future. I've always been apprehensive about buying used cars, but the moment I arrived at Park Place I was immediately greeted and put at ease by my salesperson, Shannon Low. Shannon has a very low-pressure demeanor and was very patient with me, taking the time to show me their vast inventory and wowing me with his knowledge of automobiles. He never gave me that dreaded "what will it take to buy this car today" BS either. I decided to keep my current car for another year or two, but as soon as I'm ready I'll be back to buy a car from Shannon! I am pleasantly surprised. No, actually I'm totally shocked at how great that went. Imagine my surprise when I found absolutely NONE of these tactics at Park Place. I figured they'd be even worse! I was *so* wrong. From the moment I walked onto the lot, Hunter was professional, was able to answer all my questions (although once or twice he had to go find out - which he did, quickly), and ... really helpful(!!). He didn't pester me with emails or voicemails, he left the ball firmly in my court and simply made himself available to help me with anything I wanted, on *my* schedule. Park Place, a dealer that sells Aston Martins, Ferraris, Lamborghinis and Porsches sold me a new Saab without any nickel and dime tactics, a quick and relatively painless negotiation (which was basically trading 3 phonecalls). Once we agreed on a really fair price, I walked into the showroom to sign papers and it only took half an hour to execute the sale even though they mis-spelled my name and had to reprint every form.... (my name is hard - it's mis-spelled more often than it's spelled correctly). There are a number of dealers in the area who should learn something from Park Place. Shockingly, these guys are actually doing it right. It was my great pleasure to share some time with Jamie Lankester at Park Place this past weekend. I found Jamie to be exceptionally knowledgeable and helpful -- and friendly (a character trait not often found at high-end car dealers who are often rather snooty). She pointed out the various features of the two cars I was interested in, highlighted specific features of each, and and was a very welcome passenger on test drives. I very much look forward to purchasing a car from Jamie and Park Place. I purchased a 2009 S4 from Hunter Ross/Parkplace as a surprise birthday gift to my wife of twenty years. I cannot express how thankful I am and how the entire Sales/service team worked with me to make this a total surprise - from working after hours to giving me a giftbox and key/keychain - Hunter went over and beyond . The detail shop made sure the car was flawless and the service team did their part on getting all maintenance up to date per my request at no extra cost per or deal . My daughter who is 14 has her eye on a Lotus .. I'm not sure about that but I DO know where we will be buying her first car knowing she will be safe and in a reliable fantastic vehicle whatever model it ends up being! - James and Pamela S.
I want to thank all those involved at Park Place, especially Richard Wade and David Bruski, for making my long distance car buying experience enjoyable. They went out of their way to make sure that I was satisfied and that I was provided service over and above normal situations. It is truly a reflection of a management team that is focused on service excellence. I would highly recommend your service department to anyone. Thanks for having a place where I know my car will be taken care of, without taken advantage of me. Thank you for making the car-buying experience so pleasant and for really focusing on serving us. You have gained a client for life with us. - Chris & Patricia B.
I did not buy any car from this place but I took my BMW for service there, and I sold two cars through them too. Great Service, Great Communications and good prices.